Dew Point: How Does That Effect the Arizona Monsoon? What Does It Mean To Say That The Dew Point is 55? It used to be said that when the dew point in Phoenix is 55 for more three days in a row, the desert season known as monsoon has officially arrived. What does that mean? What is a dew point of 55? Is it the same as the heat index? All air contains water vapor. The dew point (or dewpoint) is a measure of the amount of moisture in the air. The dew point of humid air is higher than the dew point of dry air. During most of the calendar year Phoenix dew point temperatures are well below 40 degrees (often in the single digits) and our relative humidity is very low. However, starting in June, our upper level wind, which is typically from a westerly direction for most of the year, begins to shift to an easterly or southeasterly direction. This wind shift is the simple definition of a monsoon: a seasonal shift in the wind. Dew point is the temperature to which the air has to drop in order for the moisture in the air to condense. Since the amount of moisture in the air is continuously varying, so are the dew point temperatures. 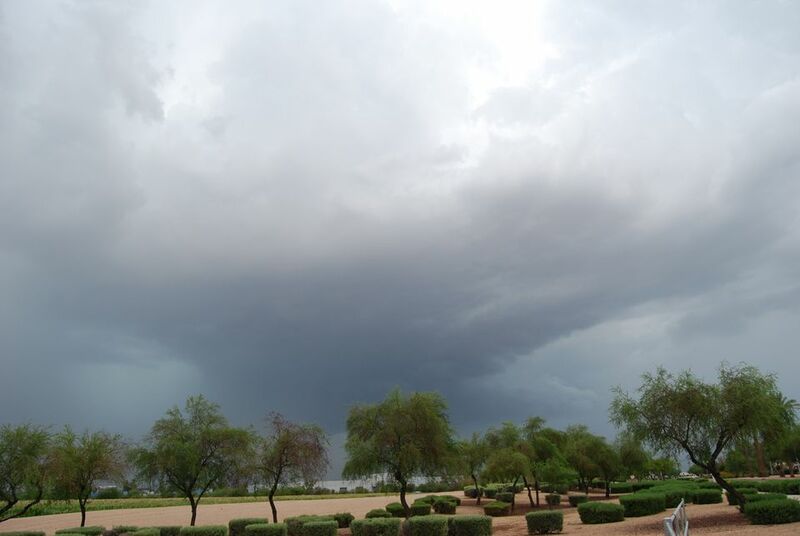 Historically, when the dew points in Phoenix gets to 55 degrees consistently, the intense surface heat of the desert, coupled with that higher level of moisture in the air generates the type of thunderstorm activity associated with the Arizona monsoon. Why is it so complicated? Well, it isn't if you are a meteorologist. Scientists needed to come up with a means to measure when it was likely there would be abundant thunderstorm activity throughout the state. Research throughout past decades determined that if the average daily dew point temperature in Phoenix was at or above 55 degrees for three consecutive days, the likelihood of statewide thunderstorms was good. That created some angst, when meteorologists would report that we had two days with a dewpoint of 55 or higher, but then the third day was lower, thus declaring on day three that monsoon had not yet begun. The counting to three consecutive days began all over again! In 2008 the National Weather Service decided to take the guesswork out of monsoon start and end dates. After all, monsoon is a season for us in Arizona. Although the four seasons have start dates that appear on a calendar, people are usually not concerned if the weather on that day is consistent with the season! In other words, Spring may start on March 21st, but it could snow, or it could be 90 degrees. It's still Spring. Likewise, most people need not be concerned with whether or not a particular dust storm or haboob was defined as monsoon storm or not. In Arizona, June 15 is defined as the first day of monsoon, and September 30 is the last day. Now we can be more concerned with monsoon safety and less concerned with definitions. Meteorologists will still track and report dew points and study monsoon weather patterns. One more thing — keep in mind that the dew point at which summer thunderstorm activity occurs in different parts of Arizona are not all 55°F. That's just what it happens to be in the Phoenix area. Special thanks to the National Weather Service in Phoenix for providing the material for this article.